Technique Using A Metallic Paint Wash….something I made up. You guys hold the future of this piece in your hands. I honestly don’t know if this chest of drawers is a winner or a dud. When I look at it I love it, but who knows if anyone else will. I painted the chest gray then did a metallic wash over the whole thing. 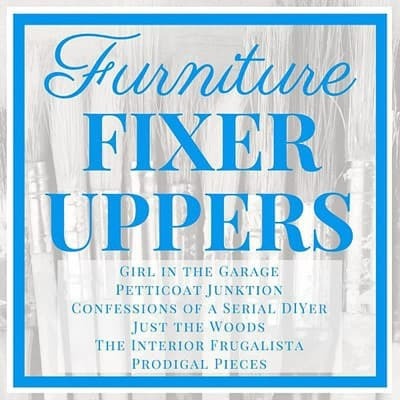 My fellow fixer uppers have projects today too so after my tutorial head over to see them. 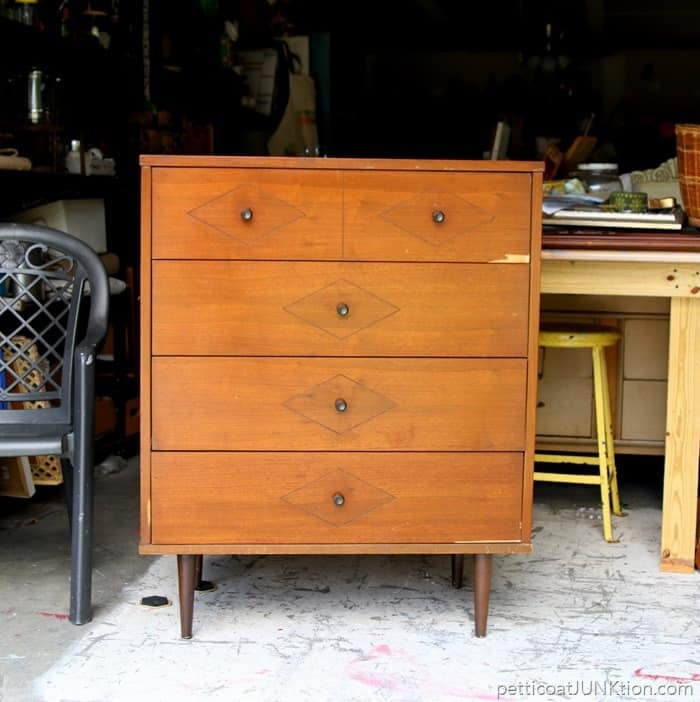 You might remember I purchased the mid-century modern chest at a thrift store in Metropolis, Illinois….home of Superman. I paid $17.50 for it. For the makeover I chose Beyond Paint, color Pewter. I was inspired by the knobs I bought at Tuesday Morning. I thought they would look awesome against the gray paint color. This is how the chest looked after two coats of Pewter. A little drab and the knobs didn’t look good with the paint. For one thing the agate(?) knobs didn’t have any depth to them so they set almost flat against the drawer. Not a good look. I decided to liven up the chest with metallic paints. I chose a light gray, a soft gold and a brilliant blue. The metallics are brushed metallics from FolkArt and have a matte finish. I watered the paints down then dabbed them on the chest. Next I dampened a lint free rag and rubbed the paint over the chest moving vertically or up and down. I love the slight sheen and the look of “rain” on the front of the chest. Now that the painting was finished it was time to decide on the knobs. 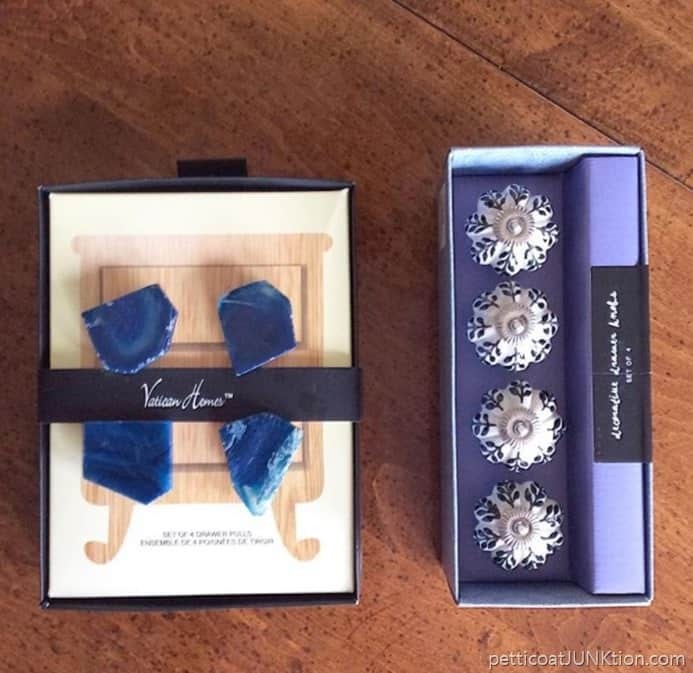 The blue agate knobs didn’t do the trick for me. The knobs with the blue design really looked good but I only had four! Next I tried some red spray painted wood knobs. No go there either. So I went to Hobby Lobby and found the beautiful red rose knobs. They were half price but still cost me almost $20 for five. They do look good against the gray paint with the metallic wash.
And that’s the story of this makeover. What is your opinion of the paint finish? Be honest but be nice! 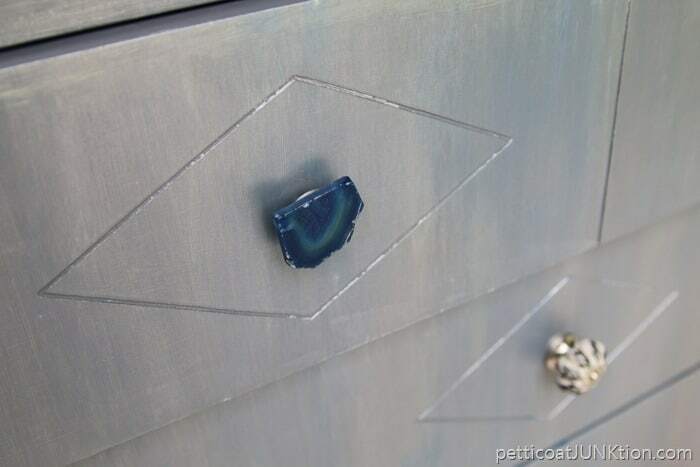 I bet you would enjoy this turquoise project that I white-washed…….White Washed Turquoise Chest. Time to see what my buddies have for us today. Just click on the pink links below the “before” photos. I don’t care for the dresser as it stands, and I was wondering why you painted the wash in an up-and-down manner rather than side-to-side. I also wonder if that would have made a difference. Above, someone said the jewelry was wearing the dresser, and I have to agree. The styles don’t seem to match. 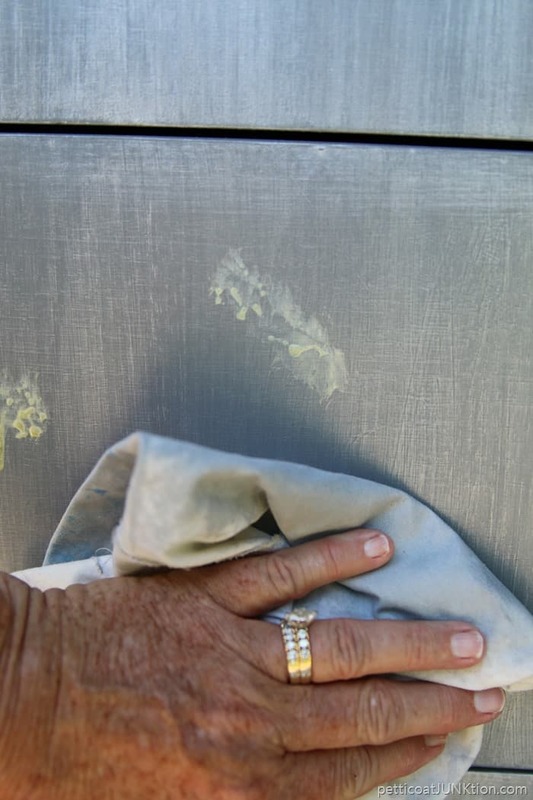 Maybe some silver knobs would have given the wash the oomph it needed. And, not being able to photograph the wash/shine just right isn’t helping us much. I can imagine that it’s very difficult to do. Hi Fonda, I may go buy those glass and silver knobs I talked about in an earlier comment. I find that the photos of my furniture are definitely different from seeing the piece in person. I knew this makeover was going to be controversial. I appreciate your thoughtful and honest comment! I adore the red rose knobs with the shimmer of the rain like effect on the dresser. It looks fabulous. A stunning piece! You rocked it! I think it is a winner. I think it’s a very cool piece. It may need a little something else, but I’m not sure what… maybe the sides of the drawers painted red? Hmmm… I do love the gray and red together though! 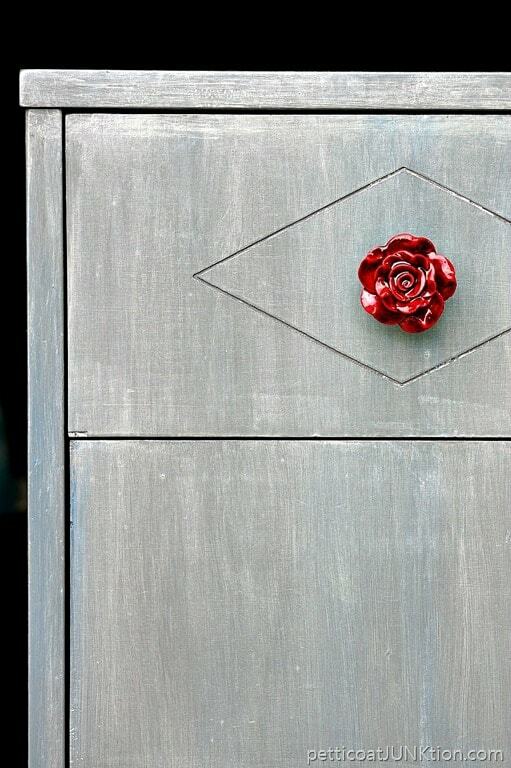 I just love those red rose drawer pulls and the way their feminine curves play against the straight lines of the piece.. so I would highlight them by painting the diamonds a metallic, pearly white. Please let us see what you decide to do with this piece! Kathy that is such a beautiful rainfall effect on the cabinet. And those knobs are WOW!! Thanks for posting this great piece! i had been thinking of doing a metallic wash and couldn’t find anyone on the web that had done it! Now I feel secure in attempting it on a dresser too! Love the nobs not sure about the gray like the wash effect. I like the painted finish but I do agree with some of the others about highlighting the diamond – my thought is just a darker blue-grey or a soft black around the outline. I am sure there will be people who love the red knobs but I don’t care for them at all. I liked the blue ones the best. I love your work and save all of your posts for future reference – you ladies all inspire me so. I like the finish. I like the knobs. I just don’t like the very straight lines of the dresser with the floral knobs! I think the dresser looks great, and I love the red rose knobs. Since you didn’t say, should I assume you mixed the three metallic paints together? Oh, gosh, Kathy, I just don’t know if I like it or not! 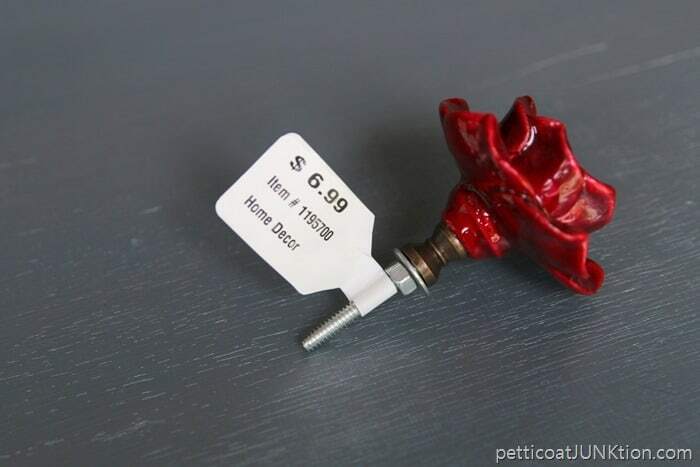 I do love those red rose knobs, though. I think my indecision has to do with not really getting the full effect of the metallic wash in the photos–maybe. 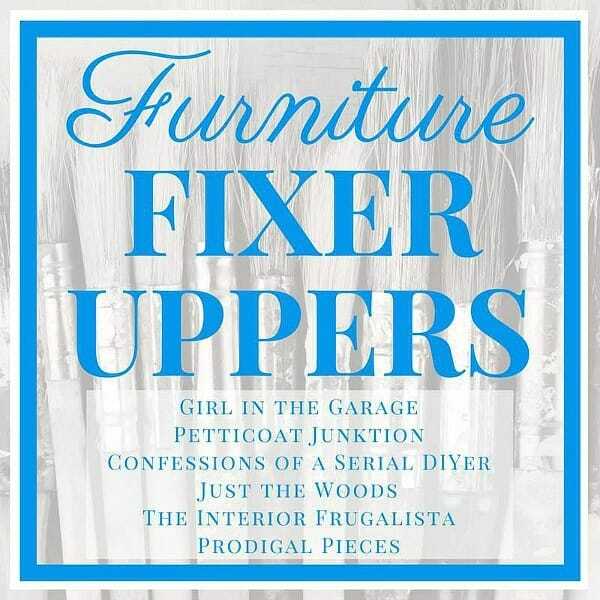 Also, the style of the dresser is not my favorite. BUT…in the right setting and for someone who loves those straight lines, I think it will be dynamite! How’s that for an ambivalent, not-very -helpful evaluation?? Just to let you know, I left a similar ambivalent response over on Marie Blackburn’s post, too! Maybe it’s the weather! I think I will be in the minority. I usually don’t say anything if I don’t like it or it’s not my taste, but you asked and I will be kind. Honestly speaking I don’t like it at all. Maybe it looks great in person, but in photos, it just looks messy. I would have treated it as an art deco piece personally. 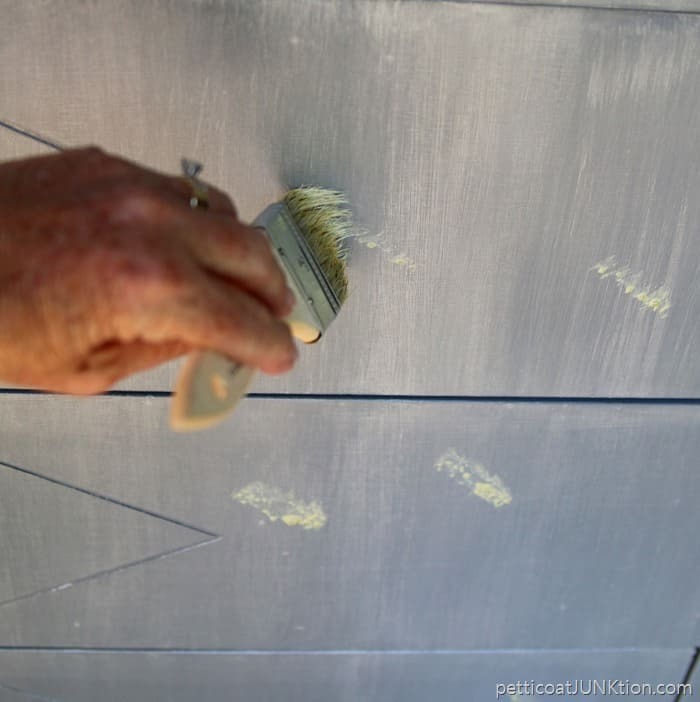 The gray maybe deeper with a pearly waxed or painted over all smooth finish rather than blotchy. It;s also a shame the diamonds weren’t used to highlight the design as well. As far as the knobs go yes, they are cute. Here is the “but” —I feel knobs are like a piece of designer clothing or jewelry on a woman. Is she wearing the jewels or are the jewels wearing her? In this case, the knobs are wearing a dresser. Please don’t hate me—I’m just expressing what you asked for and hope I was kind. Sorry, but I agree with Lindy. I love the red knobs, but am not a fan of the rest of it. Personally, I don’t like a grey anything, but adore a true silver color (aka shiny). I’d glam it up by highlighting the insets and giving it a more formal/finished look. But that’s just my taste. You asked for an honest opinion. And honestly, if I saw this in a store, I’d walk right past it without giving it a second thought. I loved this chest when you purchased it. You have a lot of people who like it now. I guess I was hoping for something different. What do you think of using a sharpie on the indents. It screams Mad Hatter to me. Paint it like it belonged in Wonderland. I love the way you dare to step outside of the box, Kathy! You know me and red, so I’m crushing on those pretty knobs that pop against the metallic finish. This is a winner! It is so beautiful! The Rose pulls bring it from just gray, to just wow! Wowza, what a beautiful finish. How you find the time to do all you do is inspirational! I look forward to seeing every post. hi I looked back at your projects and found your black chest with the gold band it’s gorgeous and I have a similar piece and want to duplicate what you did. Can you please tell me what products you used. I loooovvvve your chest. My piece is a dining room buffet and your colors will be perfect! Thank you! I really love this piece of furniture. 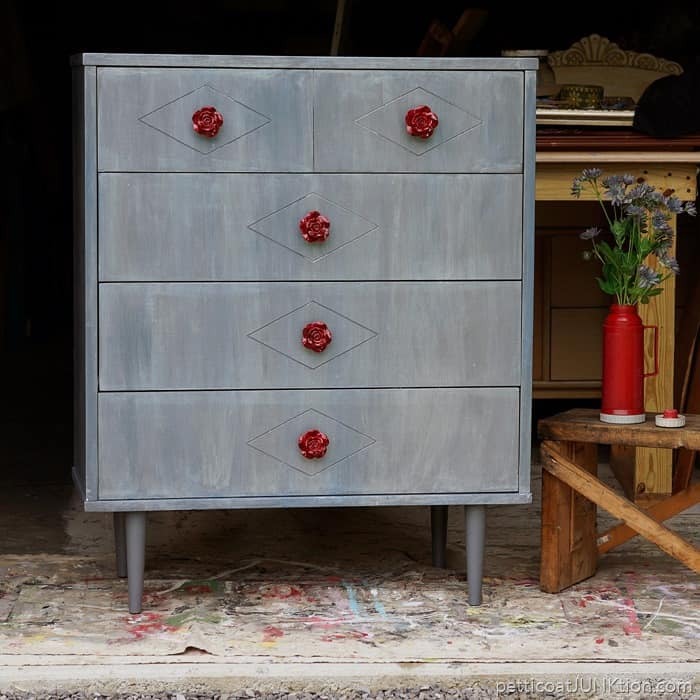 You did a great job and I really love the metallic gray with the red rose knobs. I would be proud to have this piece in any room in my home. 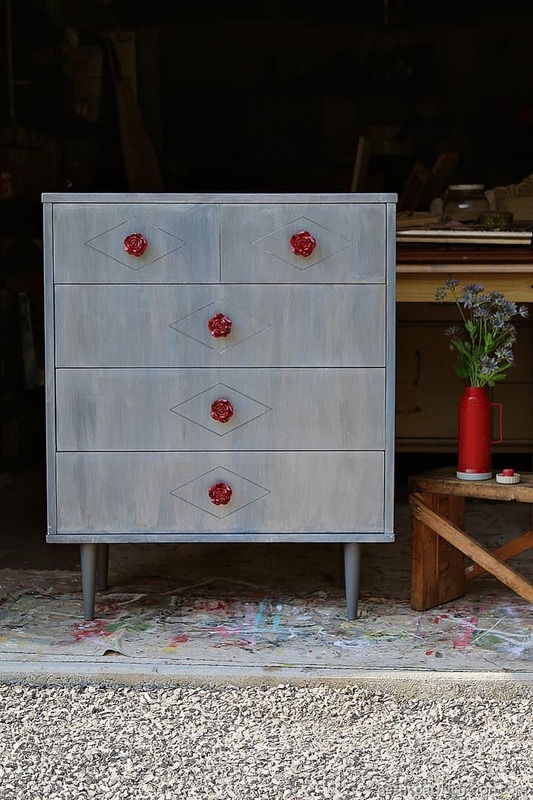 I love the juxtaposition between the masculine—the straight lines and metallic paint—and the feminine—the curvy, red rose drawer pulls! Thanks for the comment Marg! You were very kind 🙂 I may think about painting the diamond insets and the pink is nice. 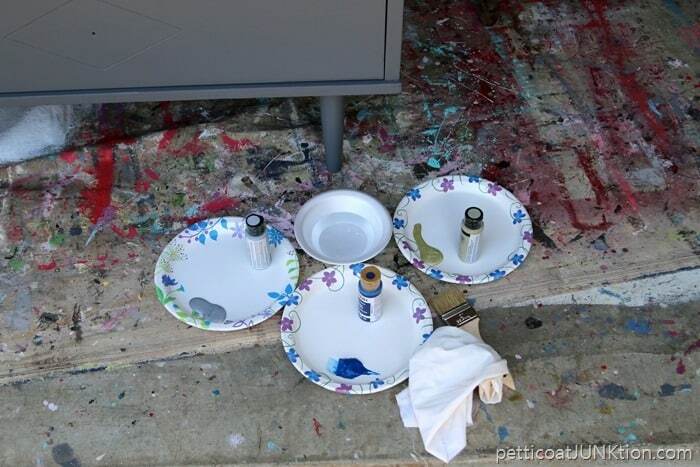 How many colors do you think are on that drop cloth?? It’s been around for a while. 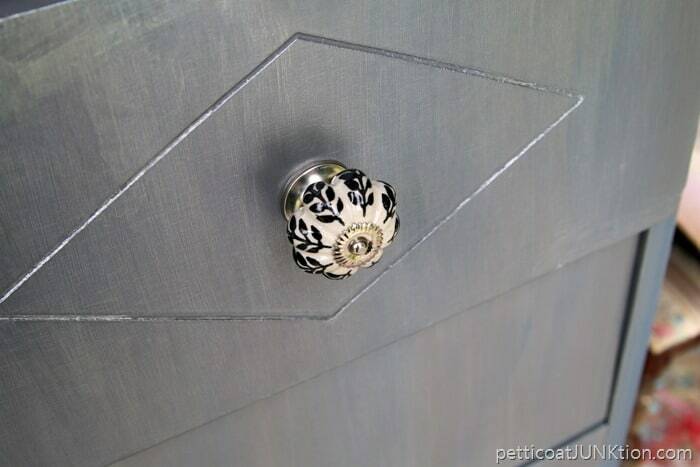 I like the knobs but I think maybe glass knobs would live it more depth. In fact now that I look at it I would try using glass on the front of the drawers with different knobs. Just a thought. Hi Effie, I almost bought some glass and silver rose knobs. The price was $10 each on sale for half price at $5. My concern was they would blend in but I think they would have been lovely. I bet that the metallic paint looks better in person. The luminosity just doesn’t show up on the picture. And I still love it! It’s very cool!! I’m glad you were brave! It does show up better in person. Just can’t get that shine in the photos. Thank you Lois. Love the dresser and the knobs! Great job! 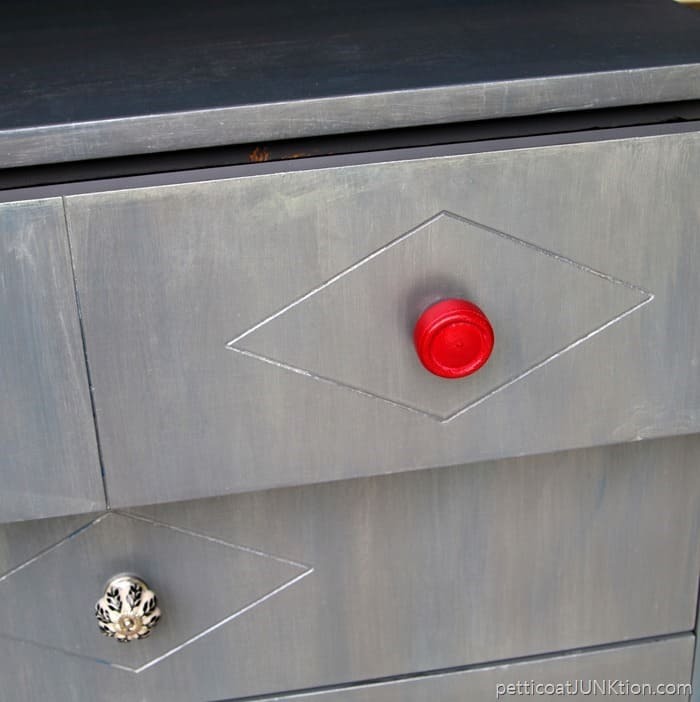 I love the color of the knobs against the gray dresser. 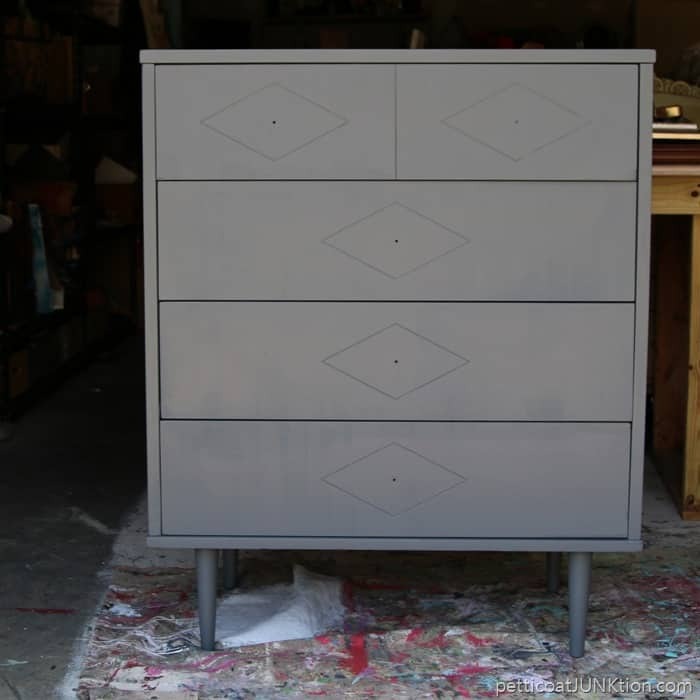 The only thing I would change is to perhaps paint the diamond shapes a contrasting color to give the dresser a little more interest. But I do like the metallic wash.
I’m lovin’ the metallic wash on this piece, gives it a subtle different look. My preference for knobs would be sparkly clear glass, but that’s just me, the red still looks nice. It’s a lovely piece and as always you did a great job on it! Hi Terry! I almost bought some glass and silver rose knobs. The price was $10 each on sale for half price at $5. My concern was they would blend in but I think they would have been lovely. 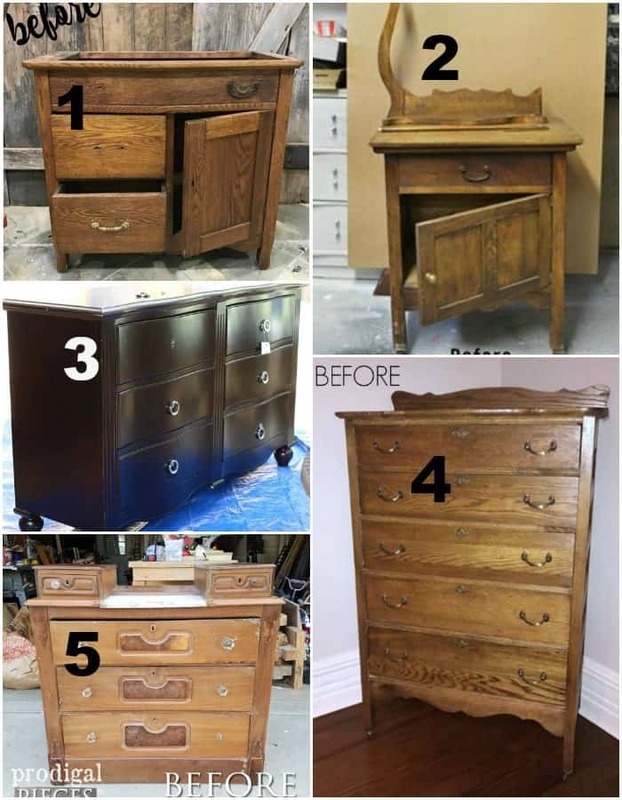 I think the dresser is lovely and would definitely use it in my home. 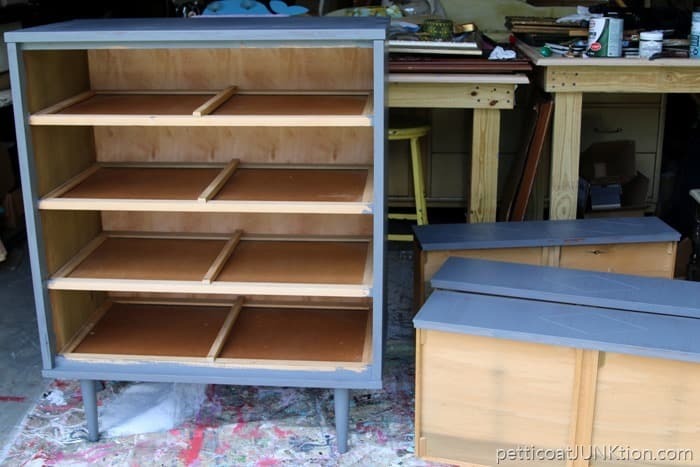 I’m going to look around my house and find a piece of furniture I can finish like this! Keep those great ideas coming! Let me know how it turns out Sandi. Thank you for the lovely comment! I love the metallic wash finish over the pewter! It looks awesome. The knobs look great too… it’s one of a kind in a very good way. Gorgeous, Kathy! I love those colours together and the red roses were worth the outlay I think, they lift the whole result to something special. Really really like the finished piece. Thanks Bobby! I’m glad you like it. That is so chic looking, Kathy. I love the red pop of knobs, and that you went bold with it. Bravo! !